Now for this weekend’s metaphorical boxing match between two of the luckiest teams in baseball. In one corner, we have the Baltimore Orioles — 48-44, in a really good division, with a run differential of -55. In this corner, you’ve got the Cleveland Indians, standing 47-45 in a pretty good division, with a run differential of -36. Stick with me while I analyze these teams with some complex baseball terminology: They are total flukes. In games decided by two runs or less, the Orioles are 32-14 (first in baseball), and the Indians are 25-16 (good for fourth). But do they have great starting pitching? Nope. Do they have great bullpen pitching? Baltimore is pretty solid, but Cleveland is near the bottom. What about run-scoring from the seventh inning on? Again, average to below average for both. Average with RISP and two outs? Mediocre. All this means that both teams have been very, very lucky to stay above, and that both are due for bad times. If you get excited by regression, then you’ll be riveted by this series, where cold, hard, statistical truth will dig its icy claws into temporary luck. Close readers will remember that last week, this feature was called “This Week’s Reason to Watch the Royals.” Unfortunately, the Royals are playing the Twins, and that is just a brutal and irredeemable series. So the Cubs get the nod, courtesy of Ryan Dempster, the MLB ERA king. The veteran is unique in that he throws his slider an insane 40.5 percent of the time, at least 6 percent more than any other pitcher in baseball. It’s effective (as is his split-fingered fastball, which is third best in MLB among 12 qualified starters), but unlike another Chicago pitcher we’ll talk about later, his metrics don’t point to him sustaining such a gaudy ERA. Still, he’s allowed zero earned runs in his last 33 innings (which were split by his second DL stint of the year). He’ll face St. Louis’s excellent Kyle Lohse tonight, and get this — at 10-4, the Cubs are the best team in the NL in July. After trying to justify watching the Royals last week, I feel like a guy who just made a serious girlfriend upgrade. Life is good! 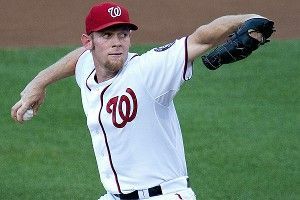 This series has Stephen Strasburg–Tommy Hanson tonight, Ryan Zimmerman looking to keep scorching the already pretty scorched earth in Washington (seriously, it’s hot there), and the Braves trying to creep up and erase that 3½-game deficit. And hey, a day-night doubleheader on Saturday. The pitching matchups are a little weak after tonight (though we will get to see Ben Sheets try to follow up his one excellent start since returning from injury), but the situation couldn’t be better; Atlanta has won eight of its last 10, and the Nationals are the most exciting team in baseball. In other news, I wore my new Gio Gonzalez shirt to the bar yesterday to watch him get shelled against the Mets. I’ve jumped on the Nats bandwagon with both feet, adopting them as a secondary NL team. It’s probably the worst thing that’s happened to D.C. since the Senators left. OK, I know I said I wasn’t going to touch that Twins-Royals series, but what can I say — Kansas City has its claws in me. I guess I didn’t think I deserved the Cubs. Maybe I just have low baseball self-esteem. Anyway, Josh Willingham is a left fielder for the Twins, and he’s hitting the laces off the ball. Seriously, Minnesota is running up a huge lace debt because of him. His line in the last seven games is .458/.567/1.000 with four home runs, six walks, and seven RBIs. Still, don’t watch this series. I’d like to take you back to May 12, when Chris Sale and the Chicago White Sox lost to the Kansas City Royals 5-0. Since that time, Sale has made 10 starts, and he’s lasted at least seven innings in eight of them. He’s given up more than two runs just once, and his ERA has dipped from 3.08 to 2.11. He’s now the second-best pitcher in the game by FIP and the third by WAR, but you have to dig deep in the rest of the stats to find what, specifically, he does well. He doesn’t have a particularly high ground-ball rate, but he allows fewer home runs per nine than any other starter in the American League. A lot of his success comes from the movement in his fastball, which only averages about 92. The movement on his two-seam is almost entirely horizontal, causing an almost-cutter-like action that’s devastating to hitters and giving it the highest accumulated value in baseball. His straight fastball also has the most horizontal movement of any pitcher in the game, and, check this out — the fifth-most-vertical movement! No wonder it’s the second-best fastball in either league per 100 pitches. With that kind of right-to-left action, velocity is almost beside the point; try hitting a pitch that’s moving either in on your hands or tailing outside. Sale throws some version of the fastball almost 60 percent of the time and keeps hitters off balance with a slider and change. Point is, he’s not getting nearly the recognition he deserves. Tune in Saturday as the Sox try to keep their 1½-game lead on the surging Tigers, who are 8-2 in their last 10. Michael Fiers, 27, was first called up to the majors last September and is seeing his first significant action in 2012 since being called up again in late May. He’s gone 3-3 in that time, but take a look at his last five games: 28.2 innings, two earned runs, 0.63 ERA, 32 strikeouts, and the highest WAR of any pitcher during that stretch. And Johnny Cueto, the ace of a playoff staff and owner of the lowest home run rate and the fourth-lowest ERA in baseball, I’ve heard he’s pretty good too. I heard it on the news — the news that I broadcast myself, from my living room. I’m going to put it on YouTube once I buy a camera. I wrote this week that I think the Phillies will make a run over the next two months, and I think it will start with a surprise series win against the Giants. Did you know Hamels hasn’t gone less than six innings in any start since his first of the year? They should call this guy Camels, because he can go for days without relief. You get what I’m saying? Like a camel can go for days without water … Oh, forget it. I GUESS NOBODY APPRECIATES A GOOD CAMEL JOKE ANY MORE. I just came up with this crazy theory, all on my own, that sometimes, when a supposedly great player leaves a team, the team can actually get better. Sort of like with Patrick Ewing and the Knicks in ’99. I can’t wait to tell my boss about this. I bet he’ll love it! Seriously, though, I’m convinced that Youk was more poison than punch for the Red Sox in 2012. The move to Chicago was obviously great for him — he turned his season around on a dime and became the Youkilis of old. But it might end up being just as great for the Red Sox. Look at the way they celebrated Cody Ross’s walk-off home run last night. When was the last time you saw a group of Red Sox look that happy? 2008? Look, they’re already a good team; the so-so record never reflected the talent, and even after a slew of injuries they’re just a game back of the final wild-card spot and have the third-best run differential in the AL. Couldn’t a little jolt of positive chemistry from not having the dour, meddling Youkilis put these guys over the top? I’m betting on “yes.” And then I’m betting on crying, because what’s worse than a good Red Sox team? Trivia: Who’s the hottest team in the month of July? At 11-2, the answer is the Oakland Athletics. This weekend’s series against the Yankees will be the toughest test to date for the resurgent A’s. They started it off with a bang last night, winning 4-3 due in large part to A.J. Griffin’s solid six-inning performance. Oakland will have to face Ivan Nova, Phil Hughes, and CC Sabathia over the next three days, but their offense as of late has been up to it. During the past 14 days, Yoenis Cepedes has hit .424 with three home runs, and Josh Reddick is close behind at .351 with two homers. The real strength of this club, though, is the pitching staff, which has amassed an MLB-low 2.63 ERA in July. Tommy Milone, who is 3-1 with a 1.32 ERA in his last four starts, goes tonight against Nova, and he’ll be backed up by the best bullpen in the American League. So, the table is set for a truly great showing against the strongest team in baseball, and if they can actually win the series, Oakland will likely find itself situated in the last wild-card position. And then we can all start talking about Billy Beane’s genius again, because he probably did something wild to change things around, like only recruiting Dutch ballplayers or something. MONEYBALL. YES! Is it me, or are the Angels the ultimate baseball underachievers in 2012? I mean, they have Trumbo, Trout, and Pujols. One is the greatest hitter of our generation, one has power up to his ears, and one could win the MVP as a rookie on the way to being the next Mickey Mantle. They have Jered Weaver, who’s 11-1 with a 2.26 ERA. They have a closer who’s allowed one run in 28 appearances since joining the team. But it’s a strange case where the rest of the parts aren’t quite vaulting them to the elite level you’d expect. The .209 batting average with RISP and two outs doesn’t help, nor did Pujols’s early slump, but I keep expecting them to break out. Maybe it happens this weekend. Meanwhile, the Rangers have dropped off in July, going 5-7 while handing the Yankees the title of best team in baseball. And that was the easy half of the month! From here, they go Angels–Red Sox–White Sox–Angels. I don’t think it’s an exaggeration to say this series will define how the rest of the year plays out in the AL West. We’ll probably see both in the playoffs, but the trajectory of how they get there could be decided in the next three days.